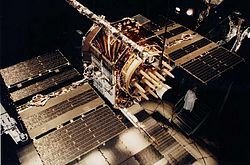 Artist's conception of GPS Block II-F satellite in Earth orbit. Civilian GPS receivers ("GPS navigation device") in a marine application. 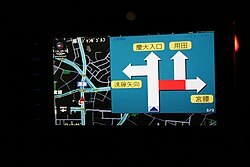 Automotive navigation system in a taxicab. A U.S. Air Force Senior Airman runs through a checklist during Global Positioning System satellite operations. ^ 3.0 3.1 NOAA. Space Segment. GPS.gov. [2019-01-20]. Parkinson; Spilker. The global positioning system. American Institute of Aeronautics and Astronautics. 1996. ISBN 978-1-56347-106-3. Jaizki Mendizabal; Roc Berenguer; Juan Melendez. GPS and Galileo. McGraw Hill. 2009. ISBN 978-0-07-159869-9. Nathaniel Bowditch. The American Practical Navigator – Chapter 11 Satellite Navigation. United States government. 2002.